Performers include: Edward Asner, Robert Walden, Mason Adams, Jack Bannon, Daryl Anderson, Linda Kelsey, and Nancy Marchand. 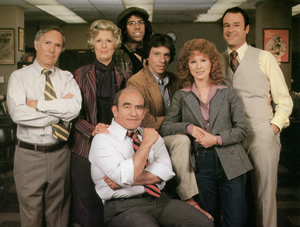 After being fired from the WJM-TV newsroom in Minneapolis-St. Paul, gruff Lou Grant (Ed Asner) gets a job as the city editor for the Los Angeles Tribune newspaper. He works under the managing editor who’s an old friend, Charles Hume (Mason Adams), and the paper’s hard-nosed owner, Margaret Pynchon (Nancy Marchand). The staff of the paper includes assistant city editor Art Donovan (Jack Bannon), arrogant reporter Joe Rossi (Robert Walden), sympathetic reporter Billie Newman (Linda Kelsey), and messy staff photographer Dennis “Animal” Price (Daryl Anderson). The show is a spin-off of the Mary Tyler Moore Show sitcom and marks one of the few times that a character moved from a comedy to a dramatic series. The Mary Tyler Moore Show: Oprah Reunites the Emmy-winning Cast!